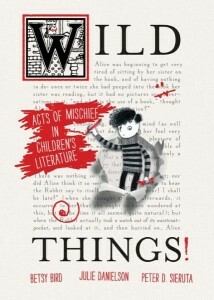 Play Misty for Me – WILD THINGS! Today we’ll tip our hat to a horsey book. Or rather, THE horsey book. This story originally premiered on Peter Sieruta’s blog, Collecting Children’s Books, back in 2008 in a post called Hoofprints and Pawtographs. We cleaned it up a bit for the book, but ultimately it didn’t quite fit in with our other chapters. A pity since it contains one of the best ALA Conference photographs of all time (which, for the longest time, we had hoped would be the very cover image for Wild Things!). For all you fans of Misty of Chincoteague, you’ve never heard a tale quite like this. 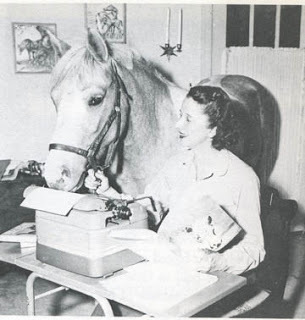 Author Marguerite Henry first saw the real Misty on “Pony Penning Day,” an annual event during which the wild ponies on Assateague Island, just off the coast of Virginia, are rounded up and swum across the channel to Chincoteague, where they are sold at auction. (Pony Penning Day continues to be held every summer. Tourists—many inspired by Henry’s book—still come to witness the stirring sight of the ponies swimming to their new home.) At Chincoteague, Mrs. Henry met “Grandpa Beebe,” who bought some of the wild ponies, and his grandchildren, Paul and Maureen, who helped gentle the feral animals. 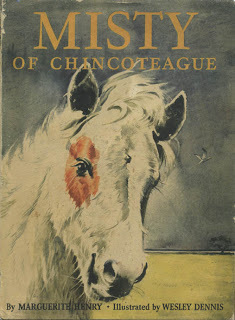 Names unchanged, the Beebe family and their community all appear in 1947’s Misty of Chincoteague; Henry paid $150 to borrow the pony from the Beebes and raise it in a meadow beside her Illinois home as she wrote the book, which won a 1948 Newbery Honor. Author Marguerite Henry honored Misty by signing copies of Chincoteague with a hand-drawn hoofprint. The formerly-wild pony became something of a literary sensation after the publication of Henry’s novel. In fact, she began moving in rarified literary circles. 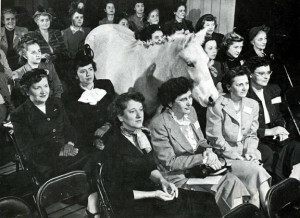 Named an honorary member of the American Library Association, Misty was invited to their annual convention in Grand Rapids, Michigan, where she rode the elevator up to the seventh floor of the Pantlind Hotel to attend a party in her honor and dropped by many meetings and lectures, as shown in the photograph below. Misty is the one not wearing a hat. We happen to think the librarians who bravely sat right behind her deserved an award as well. Henry, Marguerite. A Pictorial Life Story of Misty. New York: Rand McNally, 1976. “Misty of Chincoteague.” RoadsideAmerica.com. Undated. Web. 3 August 2011. <http://www.roadsideamerica.com/pet/misty.html>. 10 Responses to "Play Misty for Me"
Sorry this didnt make the book!!! As an update, Misty and Stormy have moved to a museum on the island. You can now see them for just $3!!!! Ooh, thanks for the update, Tom! Tom, I sort of wanted to mention the letter you sent me from Chincoteague years ago, but couldn’t quite figure out how to put it in the piece. Do you remember what you sent? It was a flyer from the place with a tiny Origami Yoda saying, “Public restrooms there are not”. Still makes me laugh to this day. Ha ha! I remember that! Betsy, if you scan the letter/flyer (assuming it’s share-able), I can FTP it to blaine.org and include it in a comment here. It’d be fun to see. Wonderful story! And I have been to the Pantlind Hotel, now known as the Amway Grand Plaza. Funny to imagine Misty in such a swanky hotel!